The grape crusher is the equipment which bursts the grape berries during the crushing operation. PMH Vinicole offers a range of three models with a crush flow from 5 to 25 tonnes/hour and which adapt to the different types of equipment able to receive the crusher. Can be handled by two people, the flow of the fresh grapes is suitable for working at 5 to 14 t/h. Crushing is very precise due to a spacing of the cylinders, adjustable from 2 to 8 mm. The equipment can be use alone, on a tank or mounted beneath our destemmers OE9 and OE16. Same model as FR14X1P. 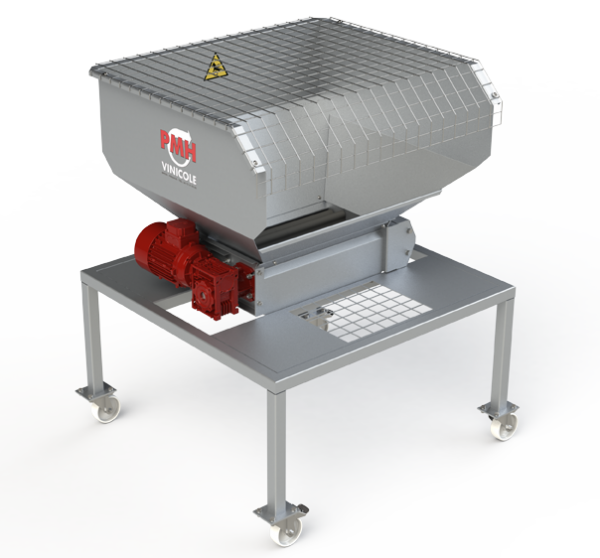 This mobile crusher on wheels, is specifically designed to be used after a sorting table and over all makes of grapes pump. The fresh grapes flow is adjustable from 15 to 25 t/h. Crushing is very precise due to a space between the cylinders, adjustable from 2 to 100 mm. The integral spacing of the cylinders allows non-crushing or free passage of the grapes (patented system). This crusher is designed to be used beneath the 0E25 destemmer. It can be used as a stand-alone, over a vat or all makes of grapes pump.